What exactly is H1N1 and why is it called swine flu? 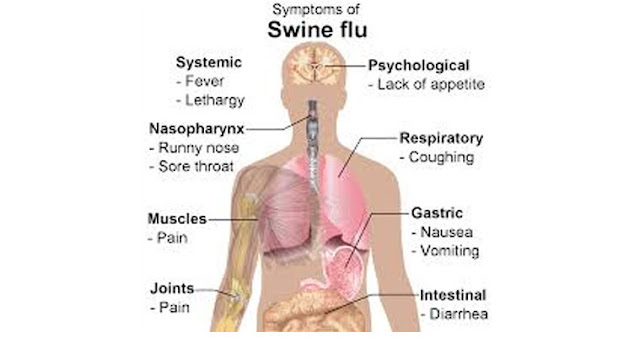 H1N1 is called swine flu because the virus was similar to influenza viruses that cause illness in pigs. In 2009, H1N1, or swine flu was called a pandemic by World Health Organization (WHO) because of its massive spread across the world. Swine flu is contagious. Influenza viruses infect the cells lining your nose, throat and lungs. It spreads in the same way as the seasonal flu. The virus spreads when you touch an infected surface or breathe cough and sneeze droplets in the air. People who have swine flu can be contagious one day before they have any symptoms, and as many as 7 days after they get sick. Kids can be contagious for as long as 10 days. Note: You can’t catch swine flu from eating pork. Cough, fever, sore throat, stuffy or runny nose, body aches, headache, chills, fatigue, vomiting, diarrhea. Young children, pregnant women, and older adults are more likely to develop complications. Swine flu can lead to more serious complications, including pneumonia and respiratory failure. And it can make conditions like diabetes or asthma worse. It can also lead to neurological conditions ranging from confusion to seizures. How do you know it’s swine flu? What’s the treatment for swine flu? The person suffering from swine flu should take proper rest, keep warm and drink plenty of water to avoid dehydration. There are antiviral medicines and antibiotics you can take to prevent or treat swine flu. The best protection is to get a flu vaccine, or flu shot, every year. Washing hands and in keeping a good hygiene are the most effective way of slowing the spread of flu.